Since long, my friend has been suggesting me to try Lakme Absolute Gloss Addict Coral Lustre for its wonderful color. Finally, I ordered for this product online and I have been using it from quite some time now. I must admit that I am impressed by the feel and look it imparts to my lips. I simply love it. The coral shade truly gets perfect points from me. Here is my review on this wonderful product which surely needs to be a part of every girl’s vanity. Lakme Absolute Gloss Addict has been created by experts at Lakmé Fashion Week for Runway-Ready lips as claimed by the brand. It promises incredible hi-shine of a liquid lip gloss & one stroke application of a lipstick. Talking about the packaging it comes in a black colored metallic finish sleek packaging with a transparent lid. The lid shuts with a click. The name of the shade is written at the base. It is quite a stylish packaging which is one of the reasons for which Lakme has increased the price of their products. It can easily be carried in your purse. It’s a coral color which comes with a gorgeous shimmer which is not too dressy or gaudy. Within 2 or 3 swipes you can get an intense coral color with a glossy effect which makes your lips shine. It’s a very classy and subtle shade which you can wear to parties and to everyday outings. In past few weeks, this shade has become the hottest shade for me. Do not expect very high pigmentation because of its glossy texture. You are required to apply 2 or 3 swipes to get an opaque finish. 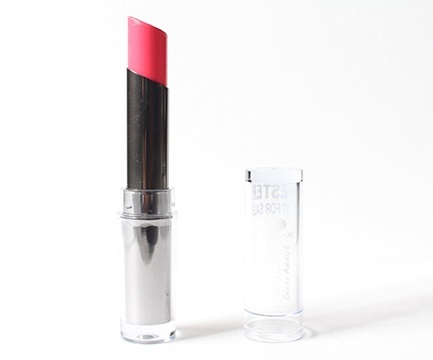 This lipstick has an amazingly smooth and glossy texture. It is highly moisturizing for all kinds of lips. It is easy to apply and beautifully glossy. I haven’t experienced any problems with its texture except one that it settles into fine lines. So make sure that you smack your lips to avoid those lines and you will be sorted. This is one disappointing thing with the product. It doesn’t have a good staying power. It can stay only for 2-3 hours and to wear it for long you need to reapply it as and when needed. This is surely one negative point of the product keeping in mind the price you pay for it. I would of course buy it again for its color which is killing but it is truly a little expensive.